When John Economos came to the United States from Greece, he had just $50 in his pocket. Decades later, he was well known in the community, thanks to his thriving & popular restaurant, The Coronet, at the northeast corner of Austin & Lake in Oak Park. But when John and his wife, Constance, decided to find a new home for their family in the early ’60s, their search turned out not to be so easy. The lot they ended up finding was the side lot of a house on Fair Oaks Avenue, which the owner had used as a garden. 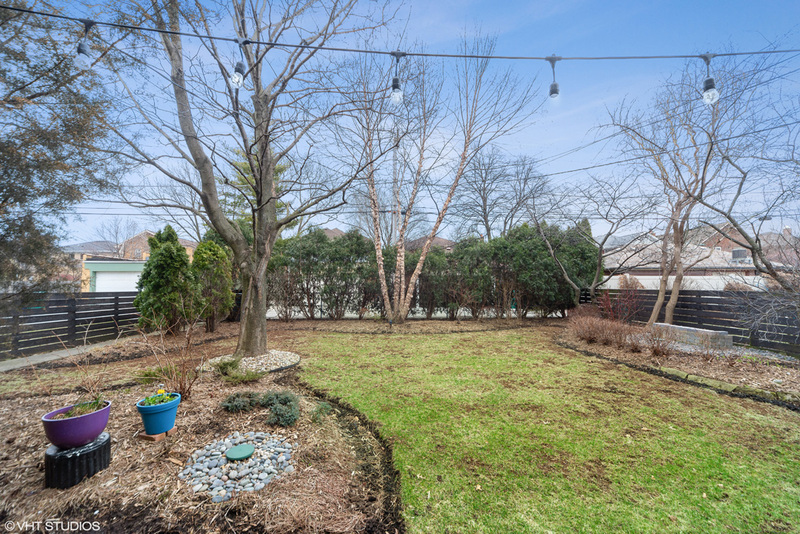 The side lot was split off and sold to the Economos family, and now they needed to find an architect. John and Constance did a lot of research, even before the house was designed, collecting catalogs from various manufacturers for products that they wanted to use in the house. Surprisingly, though, they weren’t specifically looking for a house of any particular style. But the house wasn’t perfect at first. 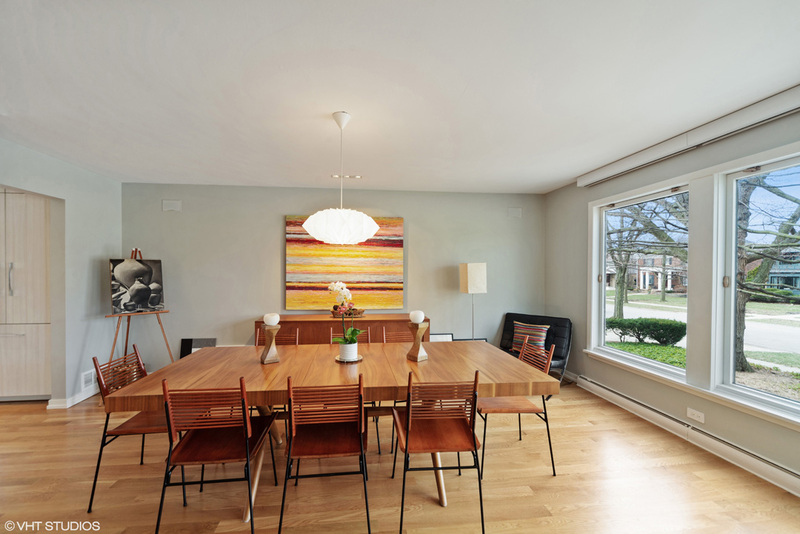 Considine went back to the drawing board and came up with the house that you see today at 1024 Fair Oaks Avenue. 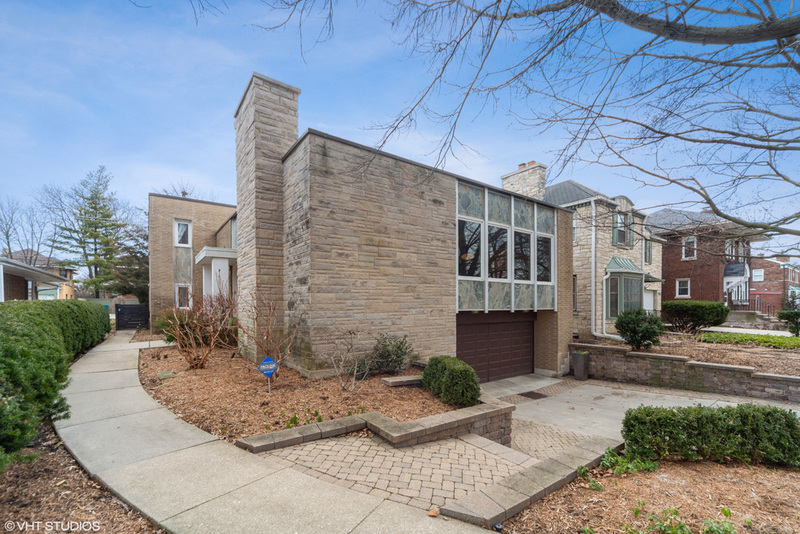 Constructed with an exterior of limestone, brick and green marble panels, the home’s modern aesthetic is a striking contrast to the mostly older American Four Square and other traditional homes in Oak Park. It’s also deceptively large. 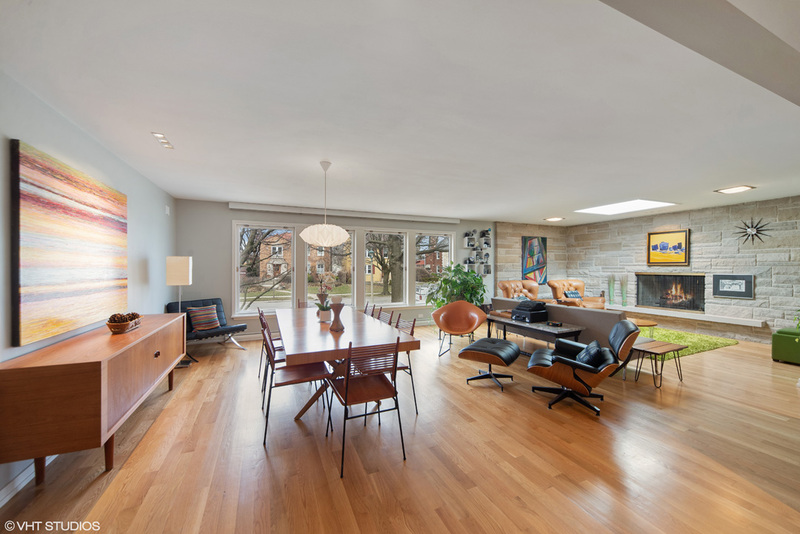 Even though it presents as relatively modest from the front, the house is just over 3,200 square feet, which was very big for 1962 (and is still larger than the average new home size in the U.S., which is a little over 2,600 square feet). 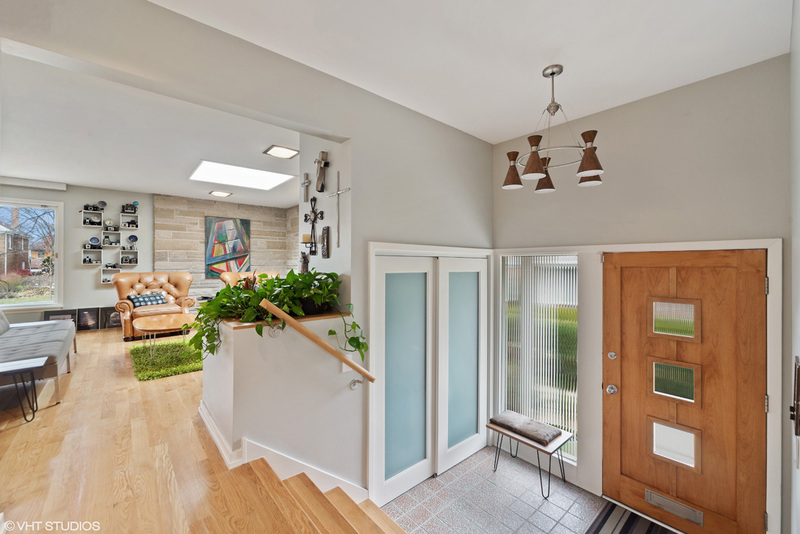 Considine’s clever design placed the entryway on the north side of the house, with the foyer welcoming guests who would then go up a few steps, past an oak-clad planter, to the large Living Room at the front of the house, with expansive, high-end Pella windows facing the street. 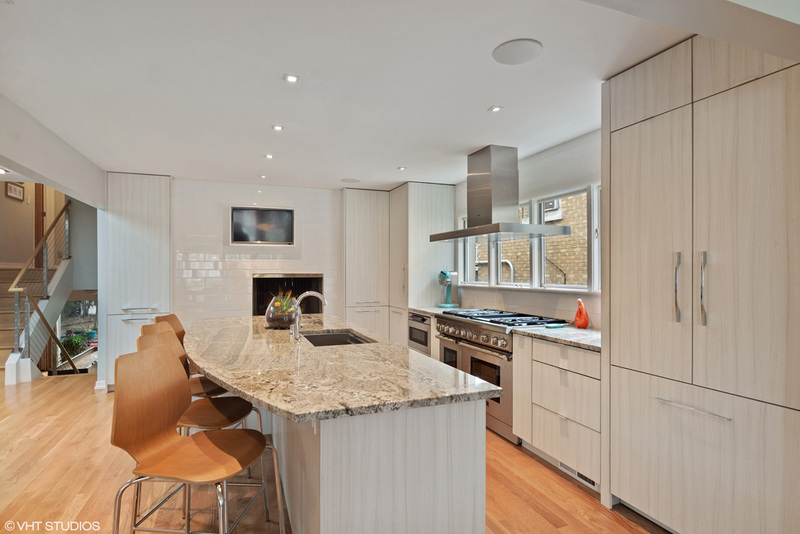 As was common in the ’50s and ’60s, often even with modern home designs, the kitchen was designed to be relatively small and out of the way, tucked in an area on the other side of the entryway, and separated by a door from the foyer so that guests knew not to go that way. In the center of the main level is one of the five bathrooms that John Economos insisted be designed into the house: A powder room that opened to the landing at the top of the foyer steps. On the opposite side of the powder room from the foyer was the Dining Room, so guests could flow from the Living Room at the front, through French doors to the Dining Room on the south side of the house. From there, steps lead half a flight up or down to the bedroom or recreation level. 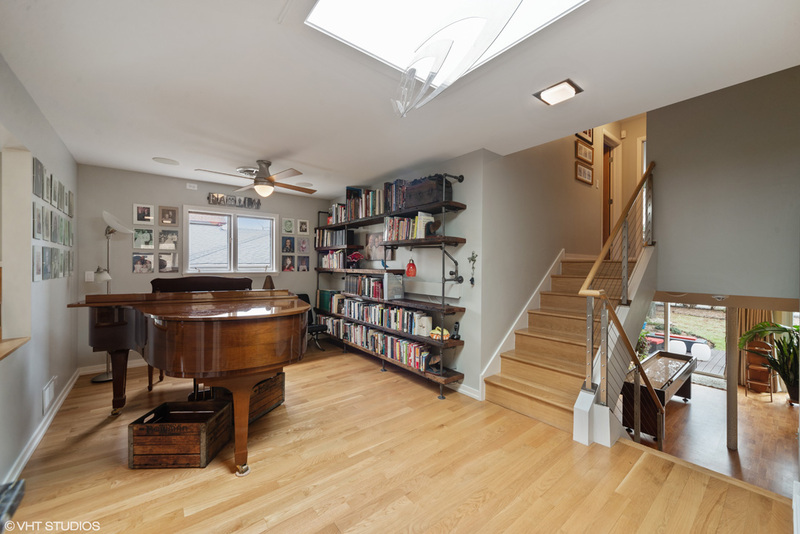 The lower level, which is actually at grade, has a wall of glass at the back, with doors out to what was originally a patio, and the backyard beyond. 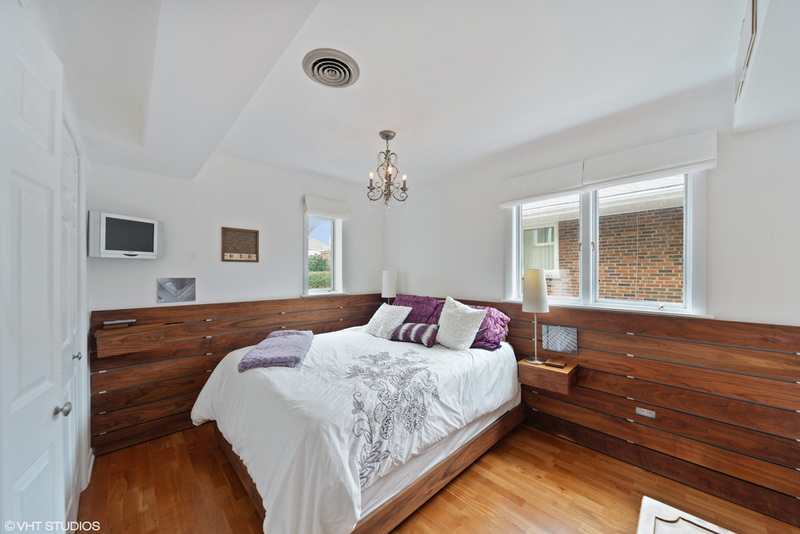 Because John Economos insisted that the house have an attached, front-facing garage, the backyard is open and free of the detached garage that most Oak Park homes have. 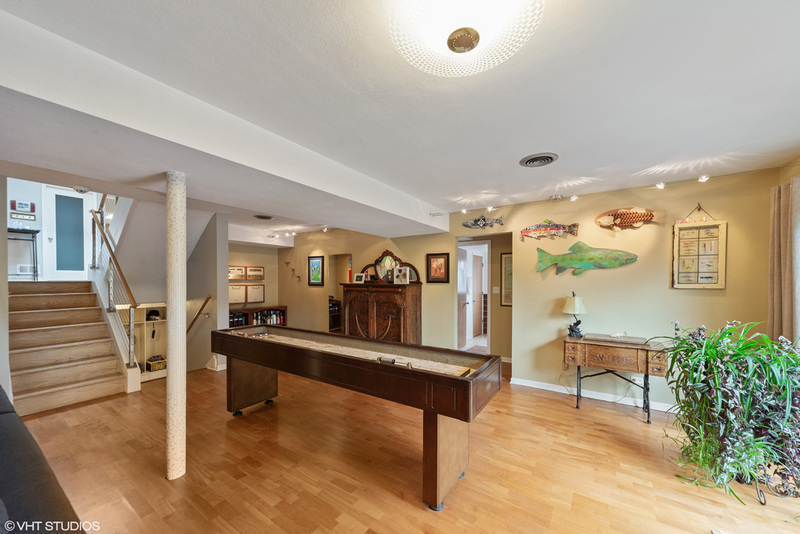 Originally, the lower level featured a cedar closet and a bar, in addition to the vast Rec Room that occupies most of that level. A couple more steps down are the Laundry Room, utilities, and then a door into the garage. And while these areas aren’t typically exciting in any given home, Pat’s Father had some specific requirements there, too. 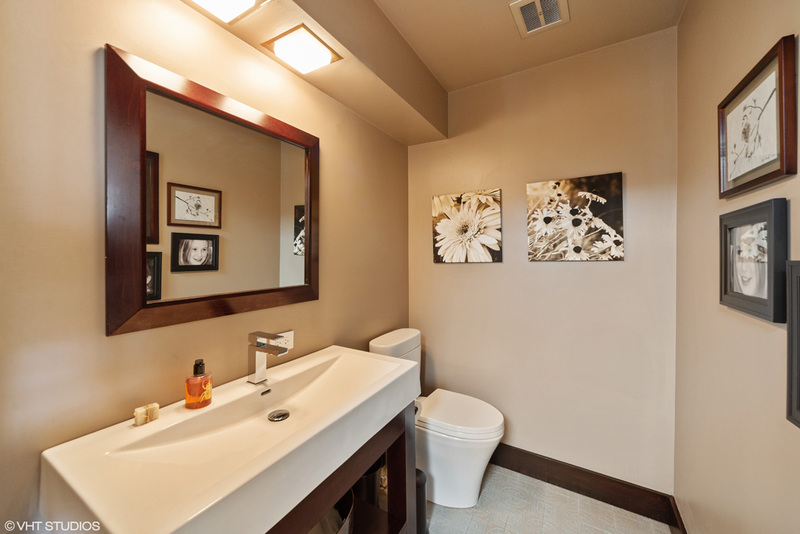 Not only is the plumbing in the house commercial-grade, but other things were over-done, too, such as the insulation, which is much better than in a traditional home. The standing seam metal roof wasn’t common on homes in the area back then, either, but the design of the house lent itself to using such a roof, and it requires very little maintenance. The 2-car garage also has a couple of storage rooms off to one side, so the house has plenty of storage. in 2005, after John and Constance had both passed away, Pat and her brother, George, refreshed the kitchen and sold the house. But the new owner didn’t seem to really appreciate the special nature of the house. Then, in 2008, Carl, an architect, and Kim, an attorney, who were relocating with their family from Texas, happened to see the house when it was for sale. At the same time, Carl could see a clear vision for the house. But when the rest of the family finally got the chance to look at the house, Carl and Kim’s daughters, Jayne and Carlee, weren’t so sure about it. 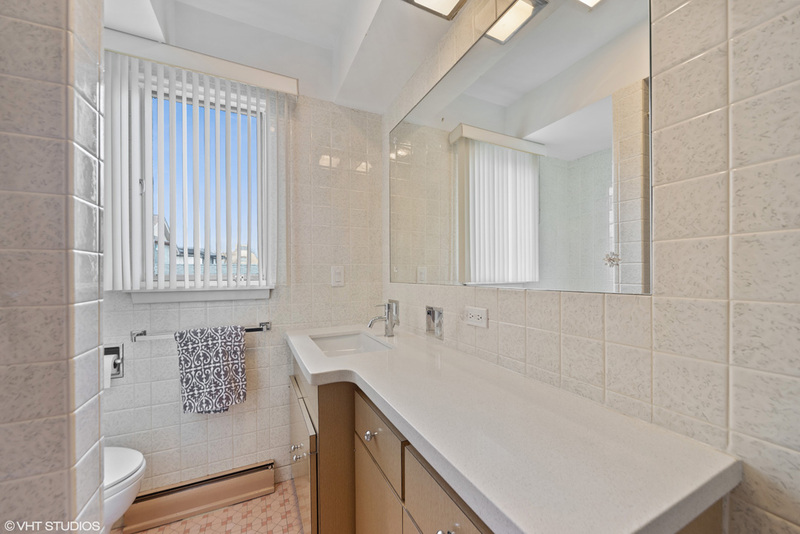 In fact, the girls may have shed a tear or two as their parents considered buying a house that seemed, to them, a bit strange with its colorful 1960s tubs and toilets. But Kim new that her then 10 and 8 year-old girls would soon become teenagers, and she saw the real value in all those bathrooms. So when it came time to undo some of what the 2nd owners had done to the house, and to bring the house into the modern age in a manner respectful to the home’s original architecture, Carl had a pretty good idea of what he wanted to do. The biggest and most notable change was the decision Carl & Kim made to move the kitchen to the other side of the main level, where the dining room originally was. 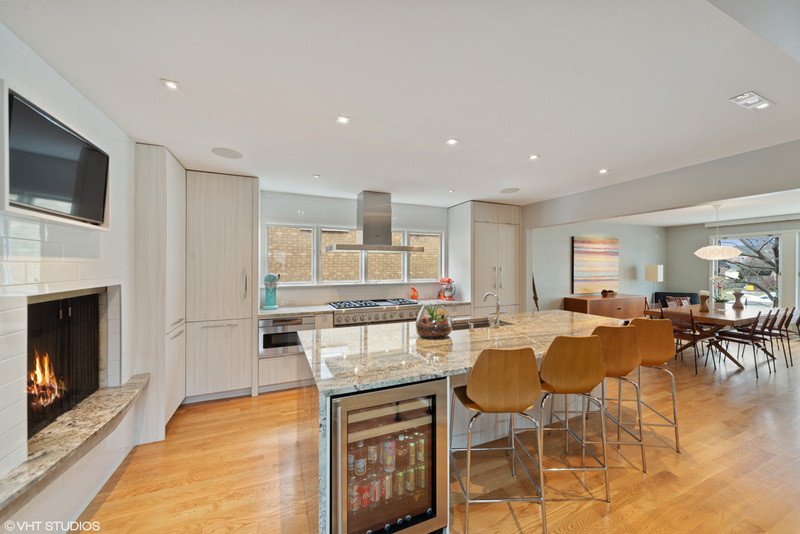 It was a much bigger space, and enabled them to open up some of the walls that had originally separated the foyer from the kitchen, allowing light from all sides of the home to flow into other spaces. 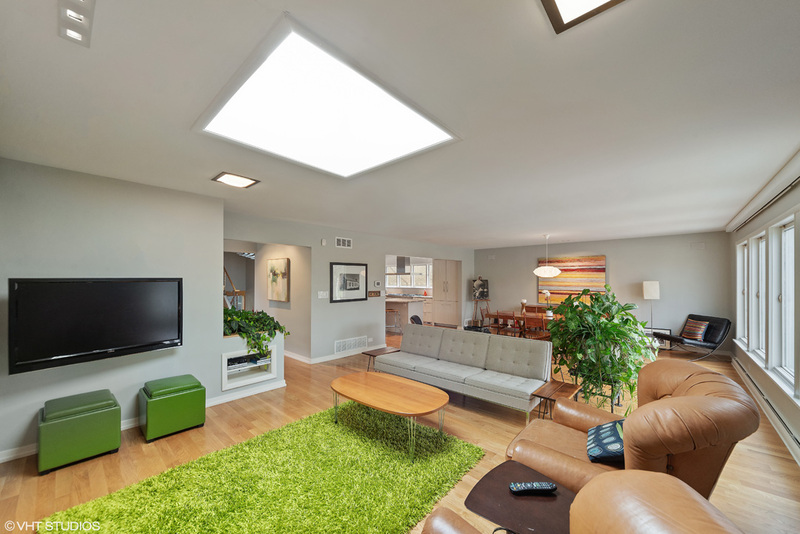 Arched doorways were made square again, the opening between the original dining room, now the kitchen, and the living room was made larger, and the two large skylights were opened up to add even more light on the main level. If relocating the kitchen was a major change, however, things upstairs didn’t need as much reworking. 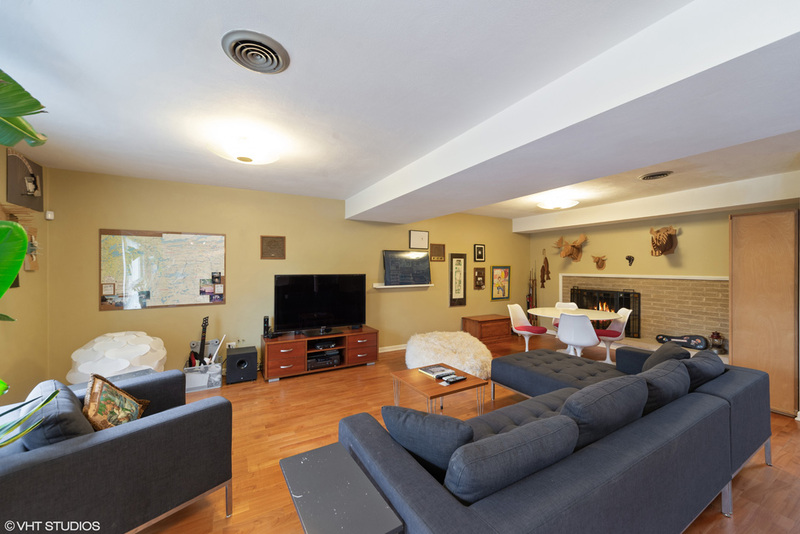 The three bedrooms on the upper level are indeed worthy of the title “retreat”. 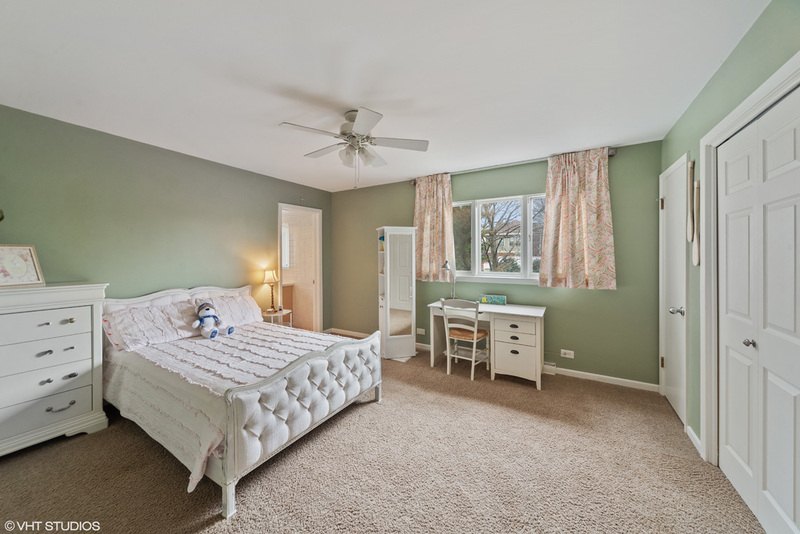 Each one has an en suite full bathroom, and each bedroom has two closets: A clothes closet with built-in shoe storage boxes to keep shoes from getting dusty, and a linen closet. 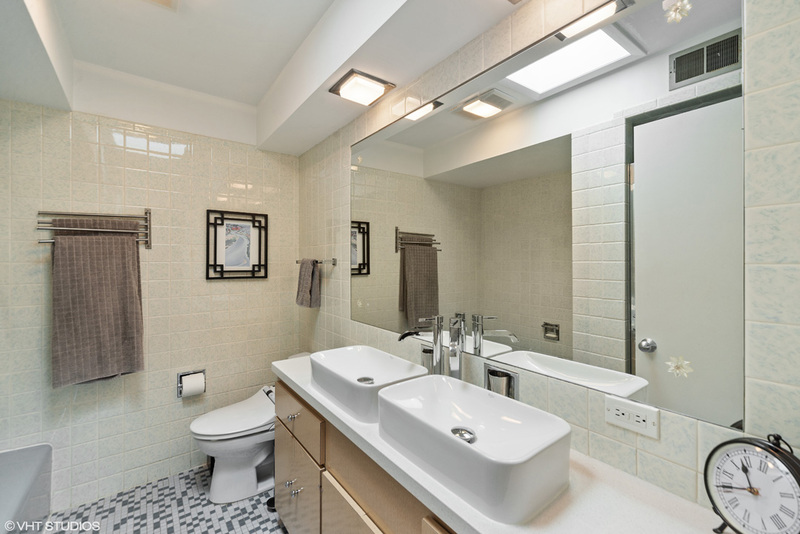 In total, Kim & Carl made quite a few updates and improvements to the house, changing things like bath fixtures while retaining original mid-century tile & tubs, which were all in excellent condition and have so much authentic character. 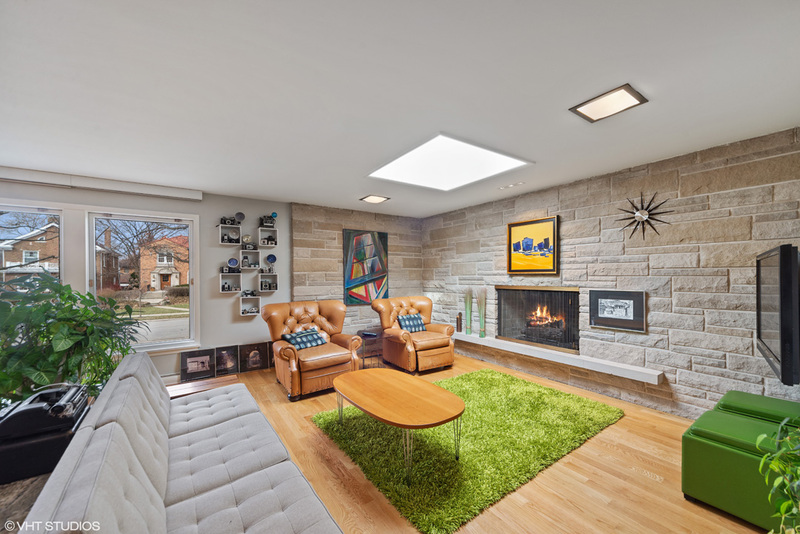 They updated the HVAC systems within the last couple of years, added new recessed and ceiling lighting in a number of areas, and have really enjoyed using the home’s original NuTone audio system, which they’ve connected an Echo Dot to to stream music throughout various parts of the house and outside in the backyard. 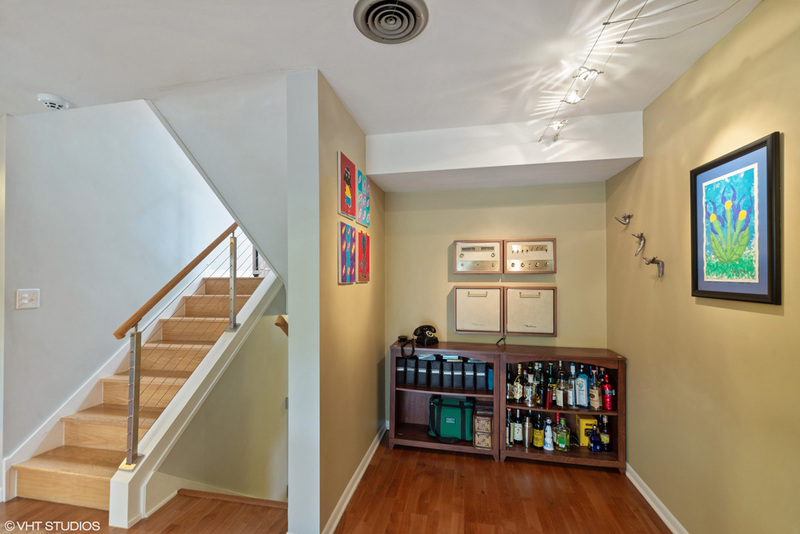 While Carl & Kim did have to undo or re-do a lot of what the 2nd owners did to the finishes and details, the lower walkout level included some layout changes that they appreciated. 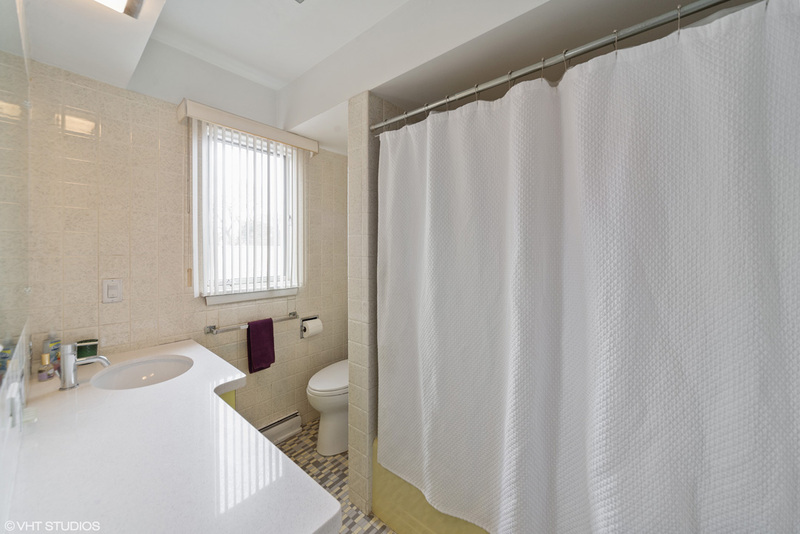 The previous owners had converted a former bar area into a 4th bedroom, and what was originally a powder room on that level, they turned into a full bath by adding a steam shower. 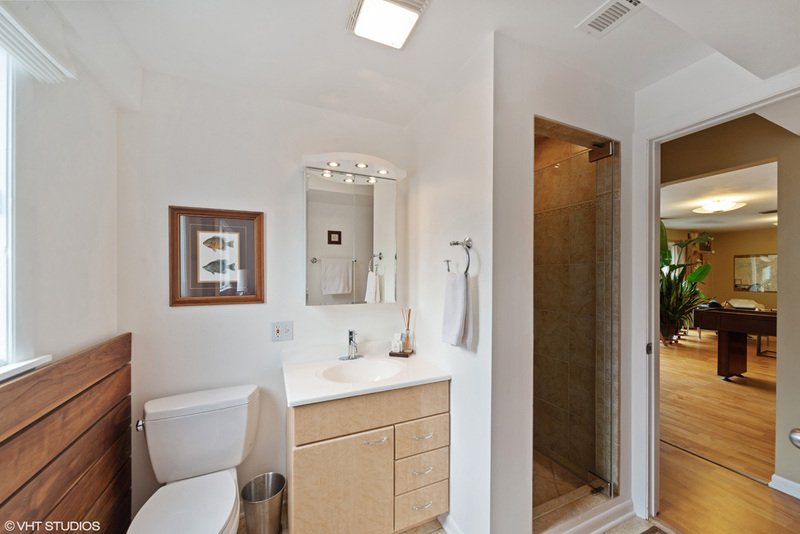 Access to the bath is both from the bedroom and from hallway off the rec room, so each bedroom in the home as a private or adjacent full bath. 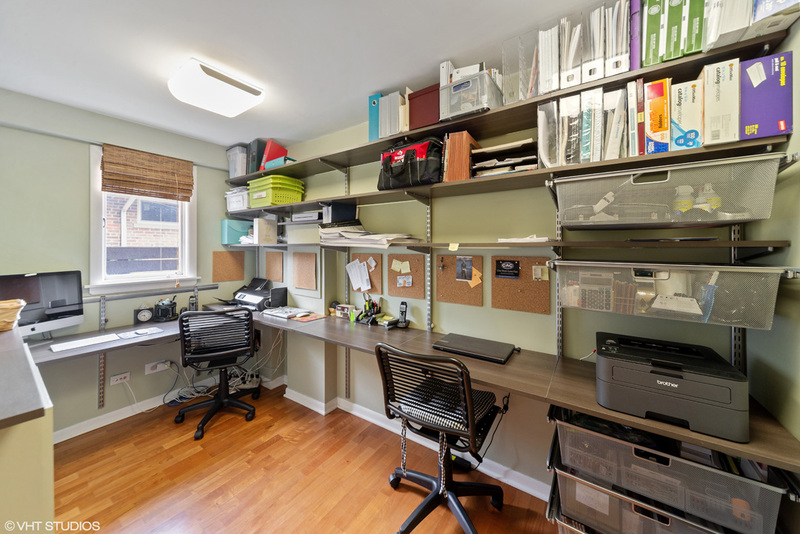 There’s also a home office on the lower level, converted by the 2nd owners from a large cedar closet. 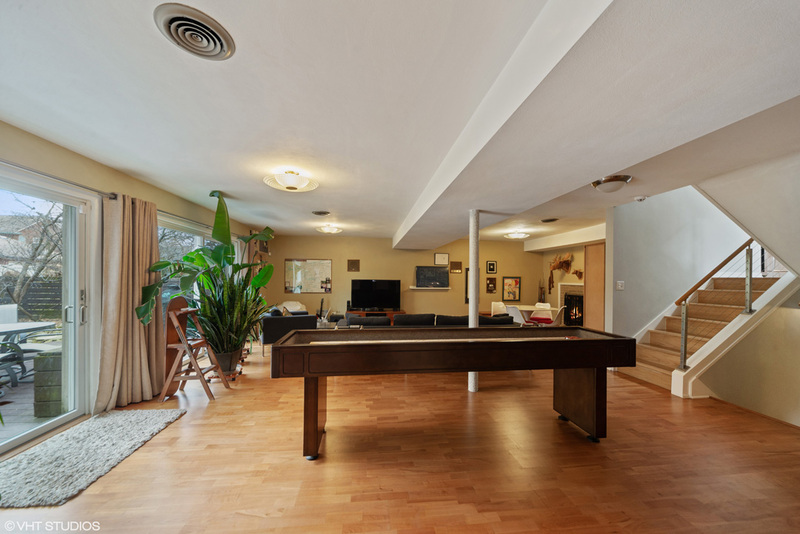 Thanks to the size of the home, clever zoning of the original plan that Carl & Kim have improved upon, and because of the large backyard that doesn’t have a detached garage in it, the home is also great for entertaining. And what do their guests think of the house? Apparently, this is not a new phenomenon. Now, due to a work opportunity for Carl, the house is on the market for just the third time in 57 years. This time, however, the home is more true to its original character than the last time, and it’s been modernized and improved in many ways to suit modern patterns of living. 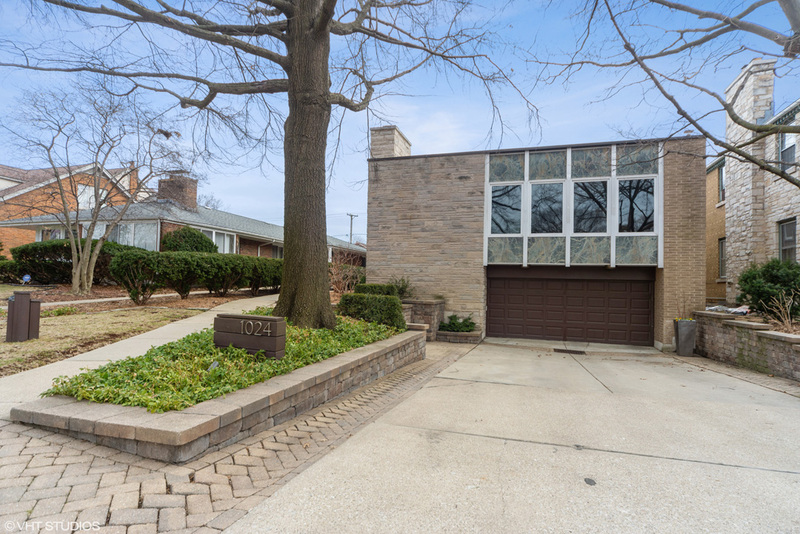 Click here to see the official listing, or call Lou Zucaro at 312.907.4085 or send an email to lou@modernil.com with questions or to set up a private showing.